(Reuters) - Pfizer Inc (PFE.N) was due to secure formal board approval on Sunday for its acquisition of Botox maker Allergan Plc (AGN.N) for more than $150 billion, creating the world's biggest drug maker, according to people familiar with the matter. The deal, the largest ever in the healthcare sector, is sure to draw political ire in a U.S. presidential election year because Pfizer would redomicile to Ireland, where Allergan is registered, in a so-called "inversion" that would slash its corporate tax rate. It will also reignite debate in the pharmaceutical industry over the role of research and development, with Allergan Chief Executive Brent Saunders, a prolific dealmaker and a skeptic of in-house drug discovery, joining the combined company in a position to influence its strategy. The deal would involve Pfizer paying with 11.3 of its shares for each Allergan share, the people said. There will also be a small cash component, accounting for less than 10 percent of the value of the deal, the people said. Pfizer's Chief Executive Ian Read, 62, will be CEO of the combined company, with Allergan's CEO Brent Saunders, 45, serving in a very senior role focused on operations and the integration, the people added. Saunders will also have a seat on the combined company's board, one of the people said. The sources asked not to be identified because the terms of the deal are not yet public. Pfizer and Allergan declined to comment. The deal would create a pharmaceutical colossus with annual sales of more than $60 billion, putting the merged group well ahead of No. 2 U.S. drugmaker Merck & Co (MRK.N), which has annual sales of about $40 billion. Widely used Pfizer drugs such as Lipitor, Viagra and nerve pain treatment Lyrica would be brought together with Allergan's Namenda memory loss treatment, Restasis dry eye medication and other leading eye-care brands. It would be the biggest merger of the year, topping beer maker Anheuser-Busch InBev's (ABI.BR) proposed $107 billion takeover of SABMiller Plc (SAB.L). And it would realize Read's longtime ambition of an inversion deal that would get Pfizer out from under the 35 percent U.S. corporate tax rate, among the world's highest. The tax rate in Ireland is 12.5 percent. Pfizer’s talks with Allergan come more than a year after the U.S. firm abandoned a bid to acquire AstraZeneca (AZN.L) and move its tax headquarters to Britain. The U.S. Treasury last year, and again last week, updated its rules on inversions to make it harder for companies to avoid U.S taxes by moving overseas. But experts have said these moves would do little to prevent Pfizer from inverting. Although Pfizer has decried the high U.S. corporate tax rate, it has minimized its U.S. taxes for years by selling its drug patents to overseas subsidiaries and then using them to make drugs that are sold back to U.S. affiliates. While generating big profit margins for its overseas arm, the practice has allowed Pfizer to report losses on its higher-taxed U.S. business in each of the past five years. Many industry analysts and investors believe Pfizer could be bulking up with Allergan's fast-growing brands as a prelude to splitting by 2017 into two companies - one selling high-margin branded drugs and one selling inexpensive generics that have dragged down Pfizer results over the past few years. 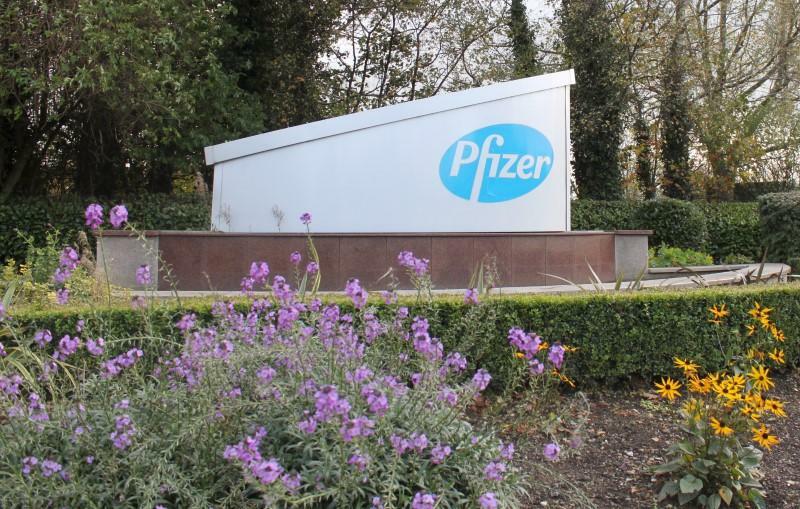 Read, a trained accountant, has said Pfizer could decide on such a split by late 2016, after it completes separate financial analyses of the two businesses. Pfizer's $15 billion purchase earlier this year of hospital products maker Hospira, which sells generic injectable drugs and is developing biosimilar versions of top-selling biotech medicines, was widely seen as a move to make its generics business more attractive ahead of a sale. Allergan has agreed to sell its own wide array of generics by early next year to Israeli drugmaker Teva Pharmaceutical Industries Ltd (TEVA.TA) for $40.5 billion. Speculation has been rife on Wall Street whether Read or Saunders would take the helm of the combined company, and whether Saunders would be content to play second fiddle to Read, who became Pfizer CEO in 2010 after more than 30 years with the company. Saunders has had a meteoric rise in the industry over the past five years, turning around eye-care company Bausch & Lomb and also leading Forest Laboratories and Swiss drugmaker Actavis, which took the Allergan name after acquiring it this year. Earlier, he won plaudits for helping Schering-Plough overcome serious quality-control problems and then leading its integration with Merck & Co.
Due to his rapid ascent and moves, Saunders has not presided over start-to-finish development of a drug, a process that can take 12 years or longer. And unlike large drugmakers who conduct costly discovery research, Saunders has said that it makes more sense economically to acquire medicines that have already shown promise in human trials. But in a recent interview, Saunders said he would be willing to put a higher emphasis on drug discovery if it makes sense for his company. Pfizer shares closed little changed on Friday at $32.18, while Allergan's rose 3.4 percent to $312.46, both on the New York Stock Exchange.